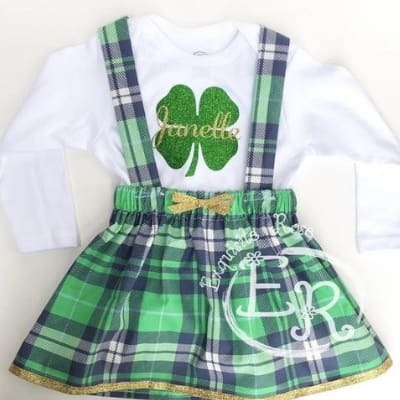 Does your little one have the luck of the Irish?! Dress them up this year in one of these lucky St. Patrick’s Day outfits for babies and toddlers. St Patrick’s Day is such a fun day to dress up your little ones. Etsy has tons of great choices. Just make sure you check the order by dates as these handmade beauties can take a little longer to arrive. I love this adorable romper outfit. You can even customize the undergarment with your little ones name! Available from size 3m all the way up to size 5! Your baby will rock their first St. Patrick’s Day with this cute bodysuit and customizeable hat. Available in NB-18M size. 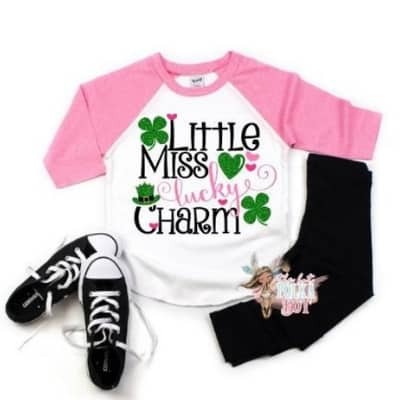 For your little girl check out this cute shirt that reads “Little Miss Lucky Charm“. It’s available from size 6m all the way up to youth 14/16 so it should fit your little girl no matter the age! I love this cute unisex tee for your crazy kid. 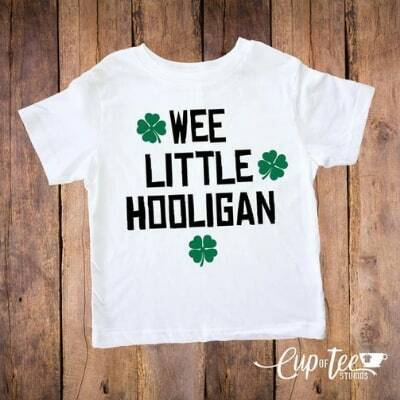 The shirt reads “Wee Little Hooligan” which is perfect for St. Patrick’s Day Shenanigans! 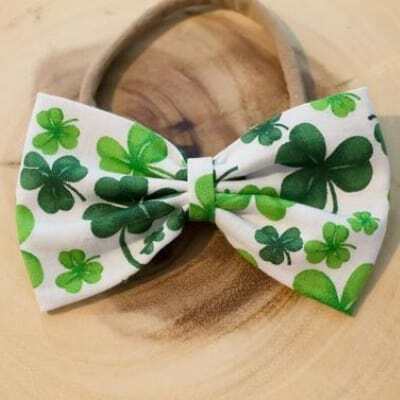 Top off any outfit with one of these cute shamrock hair bows! Love Amazon Prime or doing last minute shopping? Grab these adorable outfits on Amazon. Come on with that adorable Dino Shamrock shirt…that one is hard to beat! This cute outfit for Daddy’s favorite girl is available in size 2T up through 8 so it’s great for matching sibling outfits too! Your little Dino lover will adore this Dino themed St. Patrick’s Day shirt. Grab it in size 6m-4T. We all know kids have an excuse for everything. This cute tee is available in 18m-size 8! This one is subtle enough to be worn all year long by your sassy little lassie! Available in 2T-size 5/6.